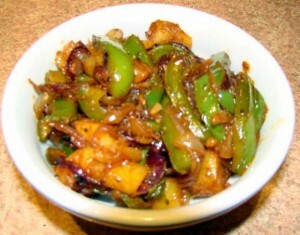 Shimla Mirch Ki Sabzi recipe by maham at PakiRecipes.com. Heat oil in a non-stick frying pan (or skillet) and fry the onions, tomatoes, ginger and garlic together with cumin and coriander powders for five minutes. Add potatoes, green bell peppers , turmeric and chilli powders and salt with half a cup of water and cook on medium low heat for fifteen minutes. Garnish with cilantro/coriander leaves .